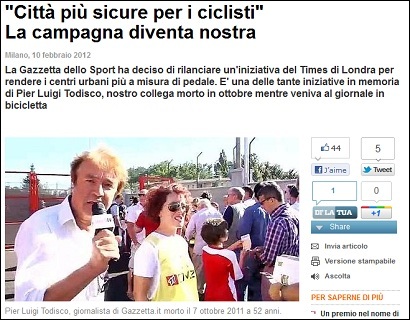 The Times’s widely praised safer cycling campaign has been picked up by an Italian newspaper. The Gazzetta dello Sport is taking part after one of its journalists, Pier Luigi Todisco, died while he was cycling to work last October. The title is urging professional sportspeople to join the roll call, and for ordinary readers to support the campaign as well. A Twitter hashtag, #salvaciclisti is being used to spread the word. According to the paper, 2,556 cyclists have died on Italian roads in the past ten years – double the number of bike deaths in the UK (1,275). The Times launched its campaign earlier this month, three months after Times journalist Mary Bowers was knocked down by a lorry while cycling to work. She is still not conscious and remains in a trauma unit. Some 33 MPs have signed an early day motion in parliament praising the cycling campaign. This entry was posted in Journalism and tagged cycling, Italy, times on February 10, 2012 by Paul McNally. Media commentator, digital soothsayer and all-round interesting read Clay Shirky gives his views on News International’s paywalls at the Times and Sunday Times, the first figures for which were released last week. Over the last 15 years, many newspaper people have assumed continuity with the analog business model, which is to say they assumed that readers could eventually be persuaded or forced pay for digital editions. This in turn suggested that the failure of any given paywall was no evidence of anything other than the need to try again. What is new about the Times’ paywall – what may in fact make it a watershed – isn’t strategy or implementation. What’s new is that it has launched as people in the news business are rethinking assumed continuity. It’s new because the people paying attention to it are now willing to regard the results as evidence of something. To the newspaper world, TimesSelect looked like an experiment. The Times and Sunday Times look like a referendum on the future. This entry was posted in Business, Newspapers, Online Journalism and tagged Business, News International, paid content, pay walls, paywall, paywalls, Sunday Times, times on November 9, 2010 by Laura Oliver. Media Week reports on figures from ComScore, which suggest that unique users of the the Times and Sunday Times websites have fallen from 2.79 million in May to 1.61 million in July. The new websites were launched on 25 May with compulsory registration introduced in June and the paywall for both sites going up on 2 July. According to the report, page views for the sites dropped from 29 million in May to 9 million in July. Prior to the launch of the new websites, News International withdrew from the monthly Audit Bureau of Circulations Electronic (ABCe) reports for newspaper website traffic. This entry was posted in Editors' pick and tagged pay wall, paywall, paywalls, Sunday Times, the Sunday Times, The Times, times, Traffic on August 17, 2010 by Laura Oliver. While many newspaper publishers see the iPad as a place for digital replicas of their print editions, the Times has joined forces with brand-strategy company Applied Works to create a series of interactive graphics for its iPad application. This entry was posted in Design and graphics, Editors' pick and tagged applied works, iPad, ipad applicatoins, ipad apps, The Times, times on August 10, 2010 by Laura Oliver. Rupert Murdoch is bullish about the role that the iPad and tablet computers will play in the future of publishing and journalism. According to a report by the Australian, Murdoch told an industry event this week in Sydney that tablet computers were “a perfect platform for our content”. It’s going to be a success. Subscriber levels are strong. We are witnessing the start of a new business model for the internet. The argument that information wants to be free is only said by those who want it for free. This entry was posted in Business, Editors' pick and tagged pay wall, pay walls, paywall, Rupert Murdoch, times on August 4, 2010 by Laura Oliver. Can writers take their own brick out of the paywall? Putting up the paywall has seen the Times lose the odd blogger along the way, but what about writers who are still commissioned, but make their content available elsewhere? The Guardian’s Martin Belam flags up a post by George Brock, who today republished in full a review he wrote for the Times, which fell behind the paywall online. Wanting to link to his work in a post, without directing his users to a paywall, he posts the full review as he submitted it to the paper. As an experiment, I’ve pasted the text I filed to the Times at the foot of this post. You can read it for free as long as the Times doesn’t object. Let’s be clear why I doing this test. I’m not against charging for editorial content, just as I’m not against paying cash for a printed paper. Copyright belongs to the paper since the review was commissioned and submitted normally. But, he adds, this should not apply to the “unbundled” journalism. While a newspaper has a legal right to restrict access to all of that material as one whole bundle, this can’t be the best way to go in the future. If charging is going to be part of the survival of quality journalism, something more flexible and agile is required. Digital technology allows journalism which was packaged together in print to be “unbundled”. Once unbundled, it can be copied, distributed, swapped, commented on and its message can multiply. But Belam is curious as to what the Times will have to say. One wonders what that will do to his chances of future commissions from the paper. This entry was posted in Business, Online Journalism, Social media and blogging and tagged George Brock, Martin Belam, paywall, The Times, times on July 19, 2010 by Rachel Bartlett. As the Times and Sunday Times’ paywalls went up earlier this month, the Guardian welcomed a former Times blogger and readers to its website with some cheeky editorial. By implying that it thinks content should be free for moral reasons, the Guardian website is playing an extremely dangerous game. It’s an approach which not only makes it hypocritical to charge for the printed newspaper and the iPhone app, but also gives hostages to fortune: what if the Murdoch paywall, or some other “micropayment” system, starts to work? Are we to believe that the Guardian wouldn’t institute something similar? Or would it be happy to be reduced to the online equivalent of a freesheet? This entry was posted in Business, Editors' pick, Newspapers and tagged david mitchell, guardian, pay wall, paywall, paywalls, times on July 13, 2010 by Laura Oliver.